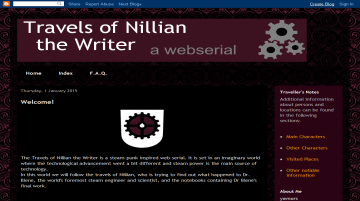 The Travels of Nillian the Writer is a steampunk inspired web-serial. It is set in an imaginary world where the technological advancement went a bit different and steam power is the main source of technology. In this world we will follow the travels of Nillian, who is trying to find out what happened to Dr. Biene, the world’s foremost steam engineer and scientist, and the notebooks containing Dr Biene’s final work. Travels of Nillian the writer has not been tagged yet. Help others find Travels of Nillian the writer by tagging it! Travels of Nillian the writer has not been reviewed yet. Travels of Nillian the writer has not been recommended yet.